President Dollar Proof Sets was in 2007! 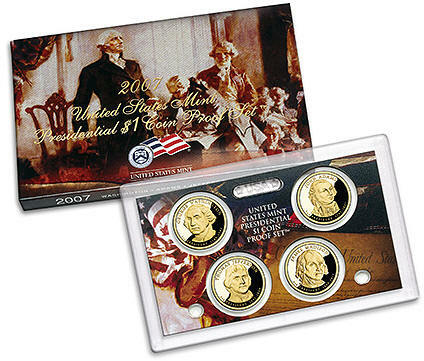 The first four proof United States Presidents $1 coins were minted and released in a special 2007 Presidential Proof Set. 2007 was the first year of the Presidential dollar coin series. The 2007 Dollar proof set coins feature the first 4 United States Presidents: George Washington $1 coin, John Adams $1 coin, Thomas Jefferson $1 coin, and the James Madison $1 coin. Each year thereafter another four US presidents are honored with a coin minted for each of them. ( See minting schedule.) The 4 yearly coins are minted and released at different times during the year. This will continue year by year until all of the deceased US presidents have been honored. In addition to proof sets, circulation versions of these presidential coins are distributed. Legislation authorizing the minting of the Presidential dollars also requires that Sacagawea dollars continue to be minted for the time being. with COA (certificate of Authenticity) as pictured above. 4 coin set in the in original mint plastic holder only. The first few years of presidential proof dollars show the date (year minted), mint mark and famous phrases ("E Pluribus Unum" and "In God We Trust") on the side. Special proof sets holders were made so that collectors can view each coin's edge-incused inscription. 2007 US Presidential $1s are be similar is size, weight and color to the US Sacagawea dollars. Some images from the United States Mint. We are proud of our reputation of pleasing our customers…..with thousands of satisfied customers.